Life sure can change overnight. One little kitty, who, when you pick her up, seems almost weightless, has changed seemingly everything. Charlie is no longer bored and crawling over me back and forth all day long. At least he hasn’t since she came home with us. He is following Ivy around, endlessly curious as to what she’s doing. And then he’s napping, his energy depleted. In the photo, it seems like there should be a bubble cartoon text above Charlie’s head. He seems perplexed, as if he’s thinking: how on earth did this happen? How is it that Ivy is sprawled out on my bed and I find myself in a little pink kitty bed? When she grows tired of him, she doesn’t hiss or bat her paws at him. She simply retreats to the carrier that I brought her home in. I guess I’ll just leave it in the living room for her to have a spot he can’t get into. I don’t think I could have found a more perfect match for us. Charlie is clearly smitten. I’ve taken so many photos of the two of them that my camera battery is now recharging. So I’ll tell you how our first night together went. I fed her Fancy Feast, and she nibbled at it a bit. I put her dry food and the Fancy Feast in the closet where Charlie couldn’t get to it. She doesn’t seem to care for her dry food. But I sometimes hear her snacking on Charlie’s dry prescription digestive diet food. Strange. I wonder if that’s okay? These two are quite the pair. She dashes around from room to room like an acrobat. Charlie trots behind her trying to keep up. Then sometimes she is following him. That’s the extension cable cord you see at the bottom of the door so I can have my TV across from the couch. I’m not much of a carpenter. I just clipped it to the door with nails. I’m sure it could be done a better way. So it would look less unsightly. But this is real life. Not a magazine shoot. 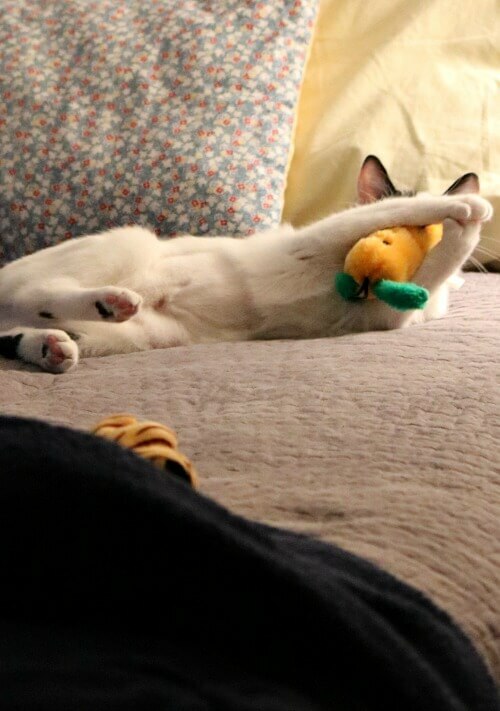 I gave her some of Charlie’s toys he never deigned to play with. He just sniffs at them and walks away. You can see in the above photo where her belly was shaved, I assume to spay her. No babies for Ivy. She will always be the baby around here, as is my Charlie boy. I did recall how cats love an empty box, so I saved a Chewy’s box for her. I threw an empty toilet roll in there and she bats it around. Charlie looks at me and then at her, clearly confused about why she’s in a cardboard box. I wonder if he’s thinking: it just gets curiouser and curiouser. So back to last night. I had supper and so did the babies and after my shower I retired to my bed to read. Charlie was laying at the end of the bed as usual, and Ivy was all over the place. She’d walk in front of my book, paw at me to pet her, and rub against me. She is very affectionate and loving. Then, after some time had passed and I was deep into the goings-on in my book, I realized that I hadn’t seen her in awhile. So I got up and started looking for her, calling her name. When I couldn’t find her, I admit my heart kind of lurched. I hadn’t known Ivy for even a day and yet the thought of somehow losing her sent a shiver down my spine. Charlie and I went from room to room, and there being only four rooms, it didn’t take long. Normally when she hears us up and about she comes running. But no Ivy. I turned on the lights in the living room and finally located her in the corner batting at something between the holes in the old treadle part of the sewing machine table. I figured it was cobwebs. But she was so intent on her find. Then I saw that she had maimed a cricket and was having fun scooting it around. Finally I turned the lights out and petted Charlie while I sang his song to him. I would have made up a song for her too if she’d settled down with us. But she was still busy exploring. In the middle of the night I got up to go to the bathroom. When I slipped on my house shoes, I felt something crinkly in the toe of the right shoe. It felt like a dry leaf. I turned on the light. She had shoved a dead cricket deep into my shoe. Yuk. During the night, she would jump up next to my head and rub and weave her body around my head, her way of begging me to pet her. She is rarely still. She is like an undulating ocean, constantly shifting and moving. I pet her and she purrs and stretches out her paws, flexes them. Why do they do that? I might have known at one time when I had cats, but if I did I’ve forgotten. We got up this morning and I went about my routine. When I had my cup of coffee, I never took my hand off the handle of the mug for fear she’d sail through the air and send it flying over my laptop. How is it that cats jump and sail through the air, and yet most of the time they land safely on a surface? I have to say it is amazing to watch. Life with Ivy so far means finding parts of cricket carcasses here and there. A leg, a body. I think maybe the crickets are somehow coming in the window where the air conditioner is, though I’ve sealed it as best I could. Here she is staring out the patio door at Charlie and me outdoors. You will probably grow sick of my photos of the two of them. I can’t help but capture both their funny and quiet moments. Life has changed for Charlie and me. Ivy has entered the equation and upended the apple cart. 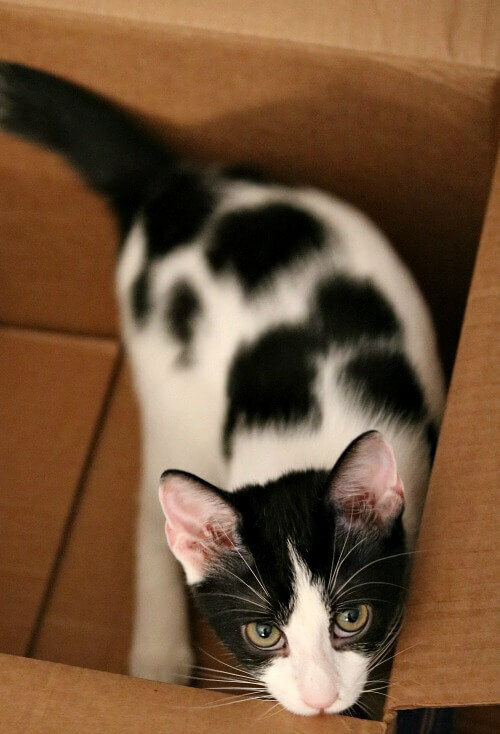 She is a quirky, funny little black and white spotted cat that immediately stole our hearts. I loved this post . It made me laugh and smile. It sounds like Ivy has brought joy to you and Charlie. How wonderful is that ? Have a great day !!! She has. Ivy has brought us joy. She is making biscuits when she does her paws like that.That,s what we call it anyway. You sound happier than you have for quite awhile. I think you found the perfect fix for your family. Just enjoy every day! I think you’re right. Something has definitely lessened inside me; the power of grief has lessened its hold on me. I’m glad you have found Ivy. I am allergic to cats so can’t have one and I can’t afford another dog, so I enjoy seeing other’s pets. Oh Laura, I sure wish you could have a pet. Not many dull moments around here. Although I just got off the phone from talking to my sister for about two hours and Ivy slept in the pet carrier pretty much the entire time. I guess she wore herself out. Oh my goodness, she is perfect for you and Charlie. She is so laid back in those pictures for not even being home 24 hours. She might not be used to dry food and it might take a bit for her to get used to it. I feed my two both wet and dry. The kitten is now five mths and eats it more now than when she was younger. I will never tire of pics of those two. She is beautiful. I know. And I think much of that is due to this particular animal rescue. Where they don’t have a lot of pets, but the pets they do have are well loved and paid attention to. Ivy didn’t have any problem coming to a new home. Congratulations on the new addition to your family! It seems like a perfect match for all three of you! She really is a good match for you and Charlie. You sound much happier and so does Charlie. Life is back in your house! I am uplifted with Ivy’s antics and her sweet affection. Ivy is such a nice name for her! Was looking forward to your post and photos today. Ivy and Charlie are off to such a compatible start as “siblings”. Laughed through your narrative and the photos!! 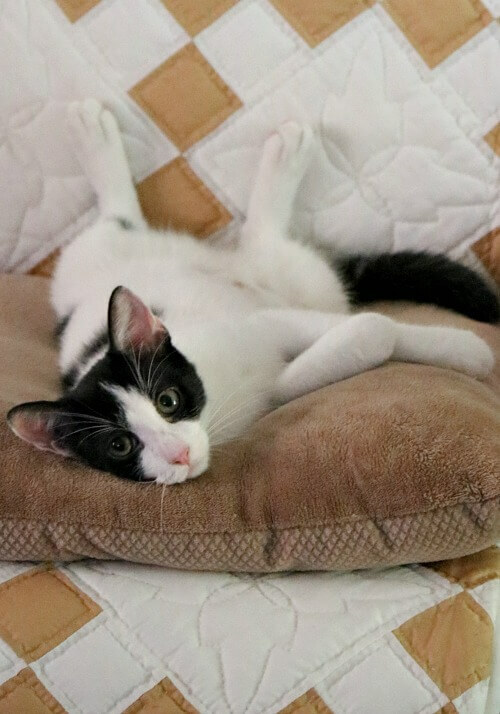 Love the photo of Charlie in the kitty bed–so funny. Whirlwind Ivy will burn energy for Charlie and enrich both your lives. She is a whirlwind, that’s for sure! I can hear happiness in your writing. Please keep the pictures coming. I sure will. Love to take pics of these two. Ivy is on the right side of me, kneading against me. Charlie has backed into his side on the left. 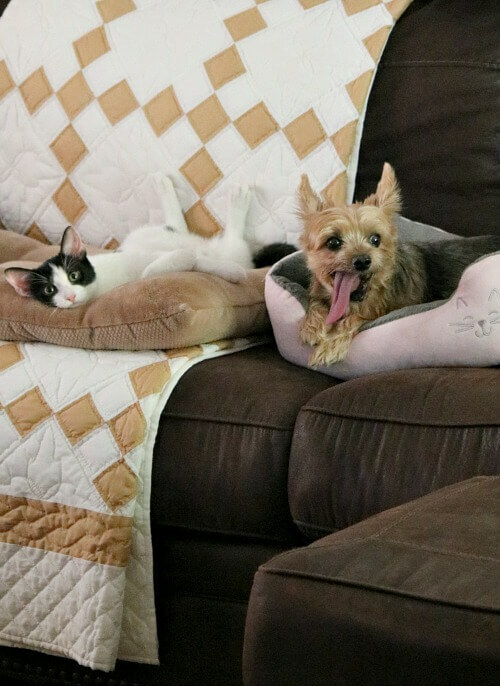 For some reason, maybe it’s a form of competition, pets will eat each other’s food and also raid each other’s beds – that was a great photo by the way, the look on Charlie’s face is priceless! I wouldn’t think that dog food would have the kind of nutrients that food formulated for a cat will have. On the other hand, in ancient times, there was no such thing as processed pet foods of any sort. I’m very allergic to cats so I’ve never had one. I know nothing about their care and feeding other than the old thing about giving them milk. But milk may not even be good for them! I have to admit that I laughed out loud when you wrote about putting your foot in you shoe in the middle of the night to go to the bathroom and there was a dead cricket stuffed in the toe. Do you suppose she was hiding it there to play with today or for a treat (ugh!) today, or did she put it inside your shoe as a gift to you? Ah, what would we be without our dearly loved pets and critters around us. I figured out how to get her to eat her food. I took it out of the closet and put it on my table in the dining room. She immediately started eating. Maybe I’ll look for a cheap table and chairs and move this smaller one into the bedroom. Would be better when Andrew and his mom comes to eat also. You have such a darling little family. I love your pictures and your stories. I’ll keep them coming. This duo gives me lots of fodder to write about! I will never get sick of your family pet photos so don’t ever think we will. It brings smiles to us as it does to you knowing all is well in your little haven of the country. I am trying to remember what the meaning is when cats leave a dead critter by the beck door……is it to show some sort of happiness to know they are earning their keep by being a hunter? Maybe someone else will know cause I think her putting the cricket in your shoe is for some reason in their domain. 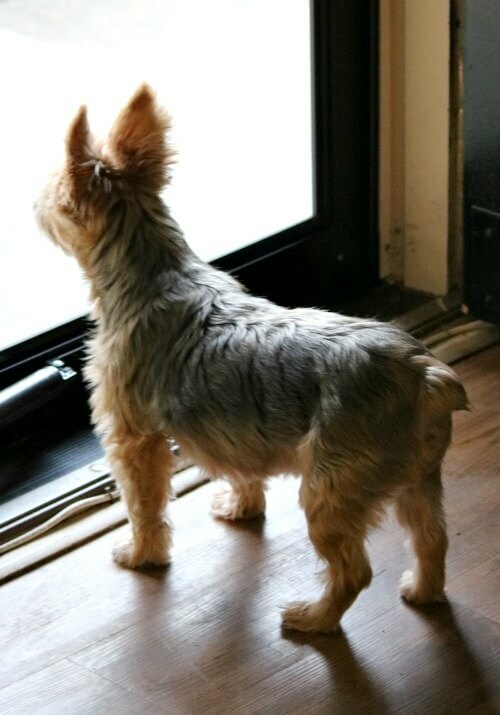 I know Ivy will be waiting by the door too when you come home and Charlie will never feel alone now. Charlie just didn’t seem to have much to look forward to. I worried about doing this, but now I can see it was a good thing. Maybe now I can go out and not feel so compelled to rush back home. I had a cat once that brought dead birds to the door. At least I have free pest control. I hate those darned crickets anyway. I’m so happy to read about your first day and night with Ivy. We’ve always loved cats; right now, we have ten (yes, 10!!!!) inside cats. They range in age from two “babies” at 3 years old to an ancient about-15-year-old senior cat. They find us. It’s like we have a big sign that says, “If you’re a homeless cat, come here and live with these people.” It sounds like you and Charlie are both smitten with your new kitten. And I think that’s wonderful. 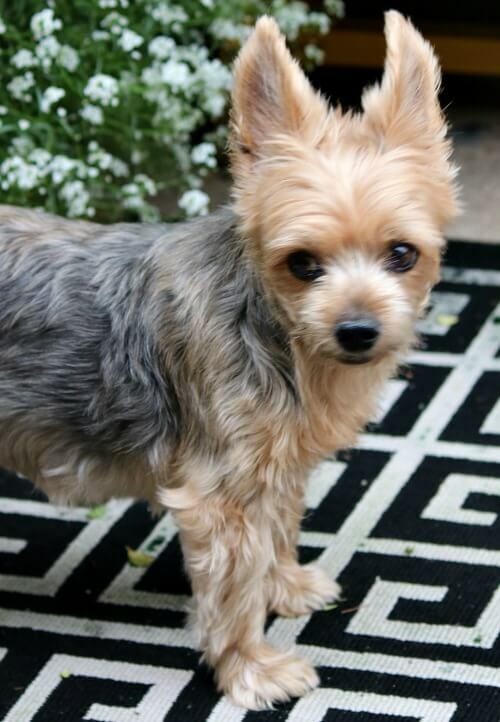 Charlie will perk up and probably act younger than he has been acting, simply because of your having another furbaby. You and he have been grieving for a long time, and both of you need ivy. She left the dead cricket in your house shoe because she loves you; they do that. And she flexes and relaxes her little paws (“kneading bread” or “making biscuits”) when they’re very content and feel loved. It’s very much the same action that a baby kitten does when nursing Mama Cat. I look forward to reading about more adventures of Charlie, Ivy, and Brenda and seeing more pictures. I love your blog! I worried that Charlie was not getting enough stimulation. Right now he’s highly entertained. Purrrrfect! Loved this post and the photos never get old or boring. Good. Because you’re going to see a lot of them! What joy in your household today. So happy for the 3 of you..There will certainly be more fun and stories for you to tell. 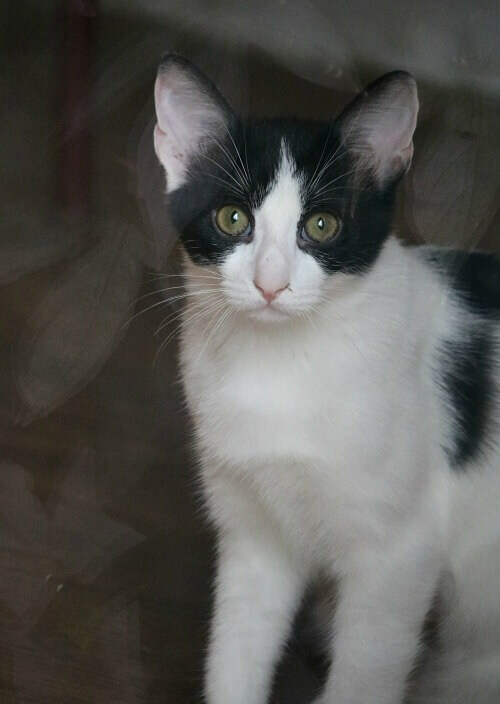 Cats have a way of keeping people (and dogs) on their toes, and in your heart…..
Ivy is a purring love machine. There is such a sense of joy in your writing and the pictures are wonderful! I can’t decide which picture is my favorite–the picture where they are looking out the window together or where Charlie is in Ivy’s bed and Ivy is in Charlie’s bed. So sweet. You have a happy little family. I do feel more light hearted than I have in a long time. I’ve been reading your blog for quite awhile. This is the first time in a long time that I’ve felt joy in your writing. You, Charlie and Ivy make are great family. A match made in heaven. To answer some of your questions regarding Ivy’s actions of leaving the cricket carcass in your slipper, just consider yourself honored. That was a gift to you from her. My kitties always left me dead mice as a sign of affection. When her paws open and then retract is a sign that she is relaxed and safe. As babies, the kittens knead the mamma cats chest to stimulate milk so they could nurse. Sounds to me like all three of you are content. I’m so looking forward to many more pics of you and your sweet family. I’m sorry the joy kind of went to the wayside. The sadness slipped over me and I just felt stuck. So happy for all three of you! And thank you for adopting a rescue cat! Post all the pictures that you want – love to see them. I would love to have adopted an adult cat, as I know they are harder to adopt. But with Charlie being 12, the vet’s office told me they might not adapt well to each other if they were both older. Well, that was fast! Her loving me. But then, I love her already too. Cats can smell your soul. They know immediately if you are good or bad. When she kneads you with her paws that is a sign she equates you with her mama. 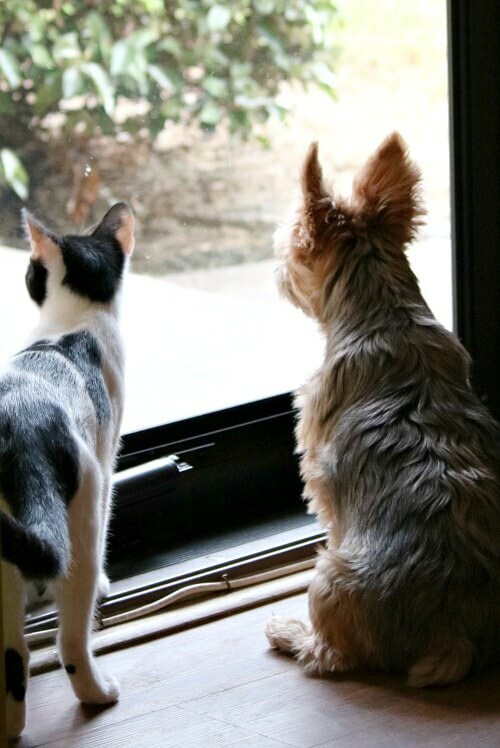 dogs and cats often get along well and become best of friends. you might find them sleeping together in the future. Such fun … so happy for you and Charlie! We are having a blast! What a joy to read the antics of Ivy and Charlie’s reaction to her. I bet he starts acting younger and perkier. And, you, too! I hope so. He seemed kind of depressed before she came. I couldn’t wait to read your post today and to see how things were going ! I love all the pictures of your babies, please keep them coming ! Ivy is a wonderful addition to your household and I am so happy for you and Charlie !! Ivy’s escapades are adorable and so are Charlie’s reactions ! 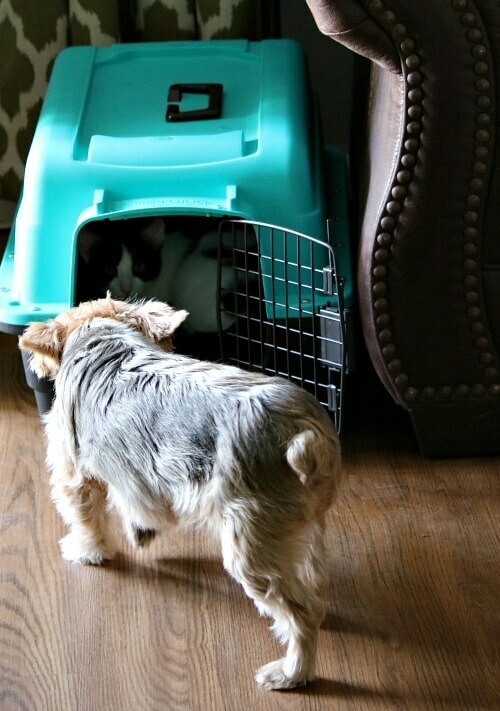 As a life long owner of cats, I have to say, Annie’s explanations of Ivy’s behaviors are right on. I loved the cricket story and the pic of the babies on each others beds !! Have a wonderful day ! She sure likes to kill crickets. I don’t know if she wants to kill them, or she accidentally kills them when playing with them. Either way, I don’t have to deal with them now accept to throw the carcasses and parts away. I forgot to tell you earlier I love Ivy’s spots on her. It fits her personality. And Charlie’s sleeping in the kitty bed is so priceless!!! I didn’t know about all the spots really until I met her in person. I found the spots adorable as well. She is as precious as Charlie! I am happy for you and your new addition. Thinking of doing the same thing as my little Jack Russell seems lonely at times and acts like a toddler when it comes to wanting moms attention lol! 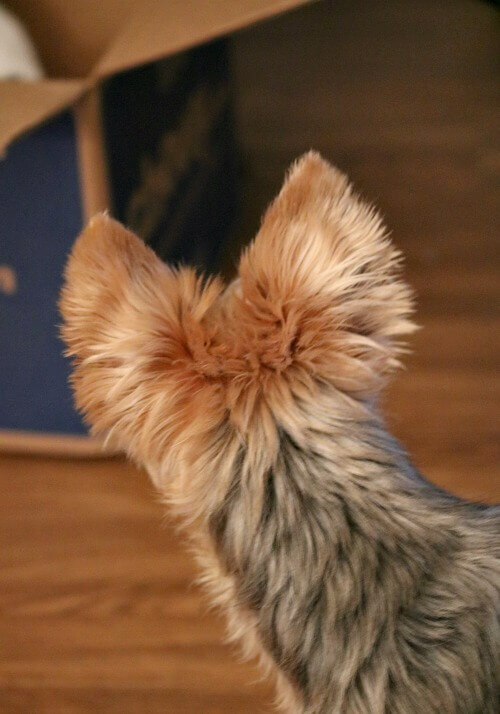 Charlie was just barking at nothing, I think just to hear himself. He seemed bored and lethargic. I hated seeing him like that. So I took the chance of adopting, hoping he would adjust and maybe even thrive. And I can see they’re great together. He’s not much of a snuggler, but Ivy sure is. And she likes to snuggle up against him. I won’t get tired of your photos of Charlie and Ivy. I love Ivy’s polka dots. I am so glad that Charlie is accepting Ivy, even if he is perplexed at the moment. Ivy seems to be right at home already. I’m so happy for all three of you. I thought it was amazing how she appeared to be right at home after just a few minutes here. So funny….she brought her new mama a gift and put it in your slipper. I love it when my cats bring me gifts, although I would rather it be a toy than a bug. And a bug usually missing a leg or two. Ivy is just what you and Charlie needed! You haven’t sounded this happy in a long time! It’s funny how you can lose a little bit more of yourself every day, and not notice it. I did not realize that I had become that melancholy. Add me to the list of peeps who will NEVER get tired of seeing pics of your cute pets! I love Ivy and how secure she is with you now! And yes – your shoe cricket is a gift of love and appreciation to you! I thought it felt like a leaf, but a kind of squishy leaf. Ew! Love your kitty and am so glad it is working out for all of you! And what a relief! I have ruminated over doing this for months. Finally just did it. LOVE the pix of your two babies, especially together. I am so thrilled for you. Ivy seems like the perfect fit at the perfect time. Cats like to bring what they think as “gifts” to their owners….you’ ll probably get many more surprises in your slippers! She does like my house slippers. That first pic had me cracking up ~ I remembered you talking about the pink bed for Ivy… and there was Charlie laying in it!! When we lived on Guam, our cat used to bring us gecko tails; seems the bodies were a delicacy for her, but the tails weren’t too tasty. Keep the stories and pictures coming!! I’ve now moved the pink bed to the top of the couch. Cats like to climb. But Ivy has decided she likes to lay next to me, right across the seam where the two cushions meet. And Charlie has his bed back. So happy for you, Brenda! I have 4 cats and a dog, and they are an endless source of joy! I read your blog every day, don’t comment much, but I was so happy to read this one! A word of advice to avoid a chubby kitty…one of mine are the dog’s food too and became quite overweight. My vet told me dog food is much higher in carbs than cat food. I’ve now gotten her to eat her kitty food. Brenda I m so happy for the three of you, Charlie appears to like having a friend and you have a wonderful, beautiful cat to care for. Ivy seems so relaxed in the photos, I think she knows she has found a great home. I couldn’t believe how completely relaxed she was so quickly. Ivy is a delight! It looks like CHarlie also thinks so. I am also happy to hear the happiness in your writing. I have 2 cats and a rough collie. They all get along splendidly. When I first signed into your blog, I said, “Goodness! She got a cat! ” I was in for a treat. Have a lovely day, Brenda. Ivy has slept much of today in her cat carrier. I guess yesterday wore her out. Well, life is certainly not going to be boring for Charlie! He is going to enjoy watching his baby sister and Ivy has settled in. She will bring you both much joy and laughter. I’m so glad you found Miss Ivy and that Charlie is a happy boy. Please continue to share photos as we are all enjoying them. Ivy would also enjoy a brown paper bag; it’s the cheap and free toys that are always a favorite. Enjoy the rest of the weekend. A brown paper bag, I’ll do that! Thanks Carol and Molly. Can’t have too much love. I don’t know where I’d put on in this apartment, or outside it. I have so few windows. One in the bedroom, one small one in the kitchen, one in the living room, and the patio door. Oh, Brenda! I am so excited for you and Charlie and Ivy! That girl doesn’t know what a lucky kitty she is! Ivy seems to be a perfect match for all concerned. I look forward to many, many pictures of the little fur babies, as well as many stories of their antics! So happy for all of you! I’m sure there will be lots of stories to tell! Not to mention photos. oh I have loved this post! what a treat at the end of this day. I’m just now on here. and the pictures are WONDERFUL! I will never tire of them. or hearing about your Charlie Boy and little Ivy! I’ve read every comment and your own reply. it just warms my heart. I’m so happy for you. they are both so beautiful!!! Well, thank you for that compliment. It means a lot to me! I found this information on google. I’m not superstitious, but this seemed nice. So the crickets bring good luck and good cheer into your house and Ivy brings the crickets to you as a gift. Sounds like the perfect combination. “What’s the spiritual meaning of a cricket? That’s interesting information. Now go hug your babies! 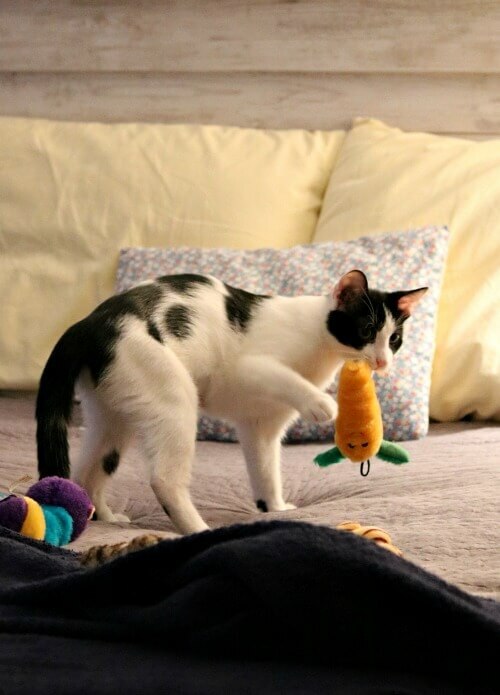 Ivy’s present to you (the cricket in your house slipper) was her way of saying “thank you for my “furever” home.” You are clearly smitten too, love the pics! It’s hard to catch her still enough to photograph her. Except when she’s getting tired or staring at something. I love this post. Your pictures are adorable. I love the one with Charlie and Ivy looking out the glass door. It is so cute. 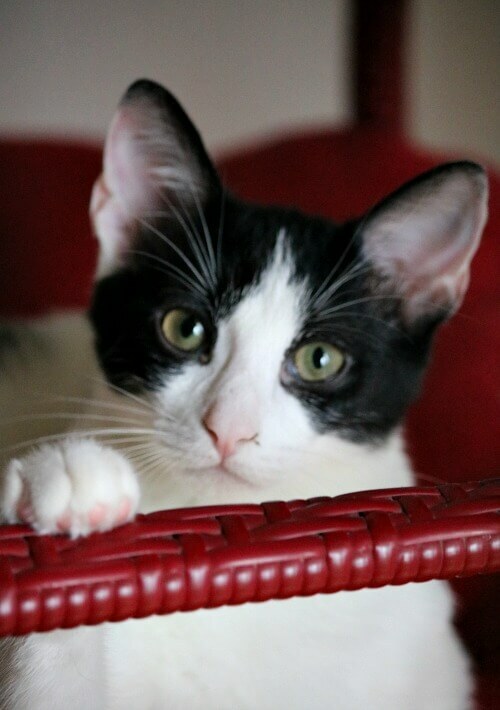 She is a beautiful kitty and it sounds like she is going to fit in your little family just fine. Can’t wait to hear what she does tomorrow. I just published today’s post (Sunday). What a success story, Brenda! I can almost feel the change in your and Charlie’s energy when I read about the doings of him and Ivy. So glad it’s working out better than well. I don’t know if I could handle the level of energy that a kitten displays, though! But I do remember when I lived at home and we had kittens how my mom and I would sometimes practically laugh our socks off at some of their antics. And they each had their own personality. In fact we had one tiny kitten that was left on our back steps and Mom took her in. We named her Wee Willy. She was always very small and her head was very small for her body. The vet said that she was a dwarf cat. And she was quite grumpy all her life. Otherwise her behavior was pretty normal. She lived to be quite old as I remember. That aside, I just want to say that your photos of Ivy and Charlie are so beautiful. In fact, I think the one of Ivy with her paw on the red rod or whatever it is deserves framing. It’s just such a nice shot of her sweet face. I went to Michaels store tonite to get a frame I’d been wanting for one of my grandson’s school pictures. I saw another one with a frame that I liked and it occurred to me that it would be nice to put a picture of Tavi in so I got it. I still haven’t looked at the photos I took the day he died, but I guess I’m anticipating doing so pretty soon since I bought the frame. Well, Congratulations on the success of adopting Ivy. Hugs for you and pats for Charlie and Ivy! Ivy has her paw on my red dining chairs. You kind of know when it’s time to frame their photos. When you can handle it. You’re right. I’m not pushing it with framing Tavi’s. buying the frame was just the first step in getting to where I can do it. I am so very happy for both you and Charlie .They are so cute together . Keep the photos coming .I especially love the one of the bed exchange it is precious . Have a wonderful Sunday ! I think Charlie was kind of mystified as to how he ended up in a little pink bed, but he is very low key and good-natured about everything. So happy Brenda that Ivy has touched your life in such a great way. Just think if she is bonding so soon after just a day she is going to really be such a great addition to your family. I am glad she is loving Charlie and Charlie is so curious of her. I bet he missed Abi and the companionship animals share. So maybe this will be good that he gets to bond with Ivy. It is a big adjustment to have a new pet but she sounds like a keeper for sure. Charlie was never alone until Abi died. I think in some ways he really loved the attention. But after a time, he seemed so bored and I felt he needed more stimulation. You sound happier and light-hearted and I’m so delighted that Charlie loves Ivy, too. Ivy kneading her paws like that is a sign of contentment. I love when cats do that. I’d be very careful with Charlie’s food and making sure Ivy doesn’t get into it. Dog food has much different nutrients in it than cat food, some of which can actually be dangerous for cats. I really didn’t know what kind of food to order. But I’ll check these links. Thanks. I don’t know what to do about Charlie’s food. I’ve only been putting a small bit in his bowl. There’s nowhere I could put it that she won’t get into it. So glad that Ivy has brought joy to both you and Charlie. Charlie will be getting his exercise trying to keep up with Ivy. What a pretty kitten Ivy is ! I love her markings and sweet face. Hope to hear about more antics to come with this new addition to the family. These two are never boring. Right now it’s quiet because they’ve worn themselves out and are sleeping. Charlie is on the ottoman by my feet. She is on his bed. I have seen them both on that bed at the same time. Candles. So much safer. Best to you and the little ones. I’ll remember that. Thanks for the tip! So very happy for you and your little family. Ivy is a beautiful little kitty and she is as blessed to be rescued by you as you and Charlie are blessed to have her. You sound very happy. Loving your “adventures”. It’s a good thing all around. I gave her a home. She gives me joy. 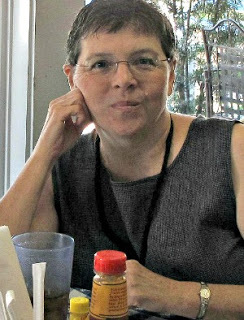 That’s me, Karen of this old house – lol..
Ah Karen, you are the ultimate pet lover with all you do for rescues. I’m so glad sweet Ivy is settling nicely into your family, Brenda! What fun she and Charlie must be having as they get to know each other! She’s adorable, and I love seeing photos of the two of them together! No doubt she will help your heart to heal with her crazy antics! I’m so happy you’ve gotten Ivy, she is just what you and Charlie needed!